Private equity firms are under pressure to win deals, grow returns and reduce capital overhang. With increasing competition in the marketplace, overcoming these challenges is getting harder not easier. A robust brand can help to address these challenges, but are private equity firms realising the value of a strong brand? Having explored the brand strength within UK based mid-market private equity firms typically investing up to £10m and £25m in European investments; this report focuses on firms investing up to £50m. We visited the websites and social media platforms of included firms and scored their performance against 14 key elements of a strong brand based purely on our perception of what we saw. 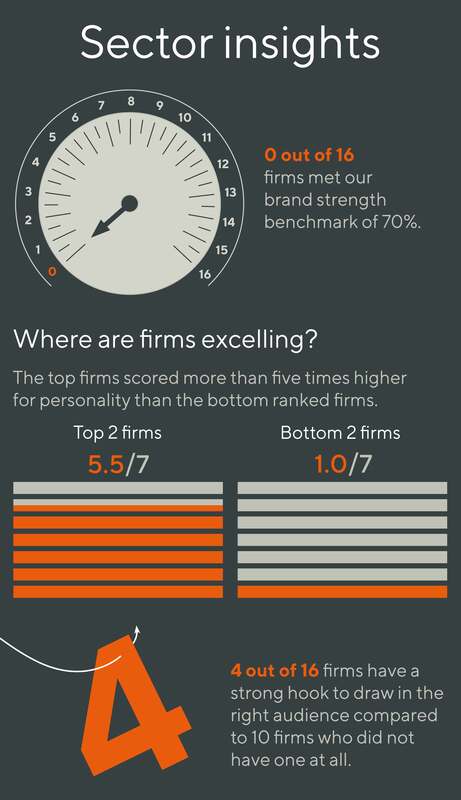 Benchmark in Private Equity III ranks firms we researched in order of brand strength. 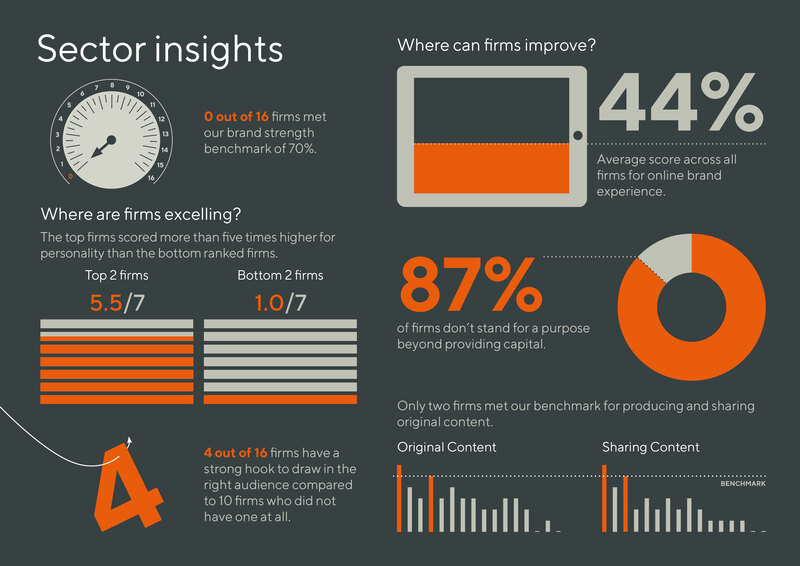 We highlight why some firms scored higher than others as well as drawing out some interesting stories and best practice case studies that we felt would be useful. From our research, we identified two areas where some firms were excelling and where others, with a few simple tweaks, could improve considerably. In today’s time-poor society, firms need to assertively signpost people to engage with them at the point of inspiration. Without this, firms run the risk of people leaving their site, never to return. A good website is clear what action it wants audiences to take on each page and we found four examples of best practice. Not everyone who visits your website is ready to enter into an investment relationship with you, but if they like your brand then you want to keep in touch with them. A number of firms send regular newsletters to maintain relationships with their audiences, just like NorthEdge Capital who have a sign up function in their page footer. As the saying goes, strike whilst the iron is hot! This applies to your calls to action too. They should be placed at the point of inspiration, making it easy for audiences to immediately initiate a relationship with you. We liked how Synova Capital included their call to action, Talk to us to find out more, directly alongside how they help businesses. People are likely to visit your site with a challenge or purpose already in mind. A good website provides seamless journeys for people with different requirements. We liked how True Capital provide two options on their Startup Innovators page, one for those who are ready to apply for funding and one for those who wish to enquire about their Innovators’ Club. Your portfolio pages are a great place to engage in conversations with potential investees. After explaining how you helped a realised investment, include a call to action such as If you’re facing the same challenge, contact us to talk about how we can help you too or If you think you are the next big player in this industry, contact us to talk about how we can help you too. None of the websites we looked at did this, but we think it’s a great way to start a productive conversation with potential investment businesses. An intuitive page naming and menu system can improve the online experience as audiences can easily find the information they are seeking. Consider naming pages based on what the audience is looking for rather than about yourself; for example consider changing What we do to How we help. When people reach the bottom of a page they shouldn’t have to scroll back up to the primary navigation to explore further. This is especially important on your mobile site; no one wants to scroll back to the top after a long page on a mobile screen! Provide some relevant and appropriate navigation options at the bottom of each page. Using your site should be intuitive, so visitors can find the information they need early and quickly but you also want them to devote some of their precious time to reading your content and getting to know your firm. Your site should not only include signposting to further relevant content but also have a good mixture of interactive content such as audio and motion graphics. A strong narrative will hook the reader and engage them in the story of your brand. Your portfolio section is a great area where you can strengthen your narrative. Ensure it outlines the business context, the challenge faced, the solution you introduced and the outcome of your work. Telling a good story can help audiences picture how you can help them too. We have worked with a number of private equity firms, supporting them to create robust brands that are built on a firm foundation. Visit our case studies to find out how we helped them to obliterate indifference. To return to this page use the Benchmark in Private Equity III link in the footer below. Want to improve your brand’s strength?